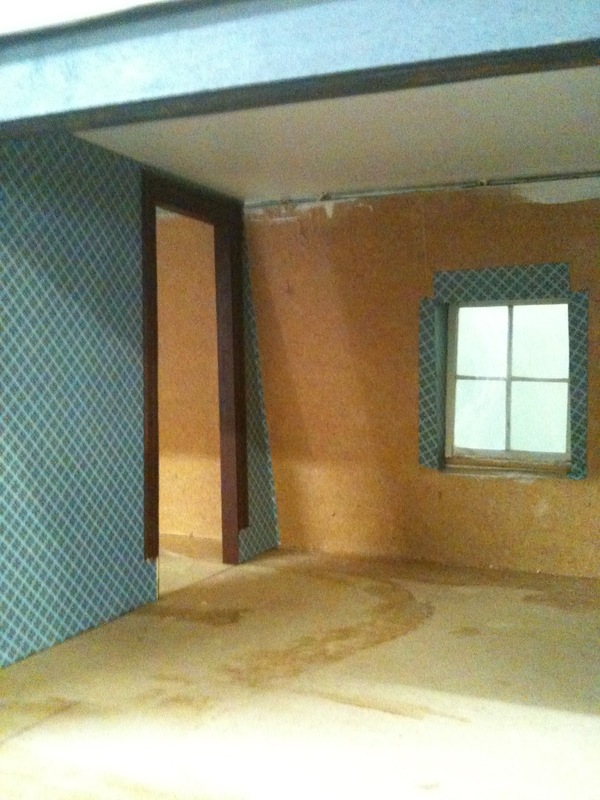 I continued on the attic rooms today. I decided on a blue bedroom to the right, a yellow corridor and a small bathroom on the left (the colour of which is yet to be decided). I chose the blue pattern for the bedroom. Wallpapering such an oddly shaped room was a challenge. 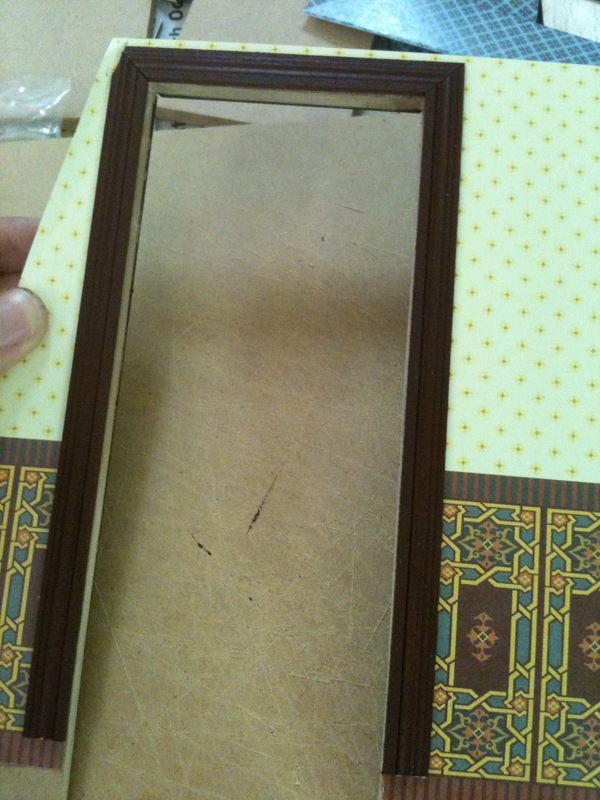 So I began with the window, fanning the paper out so the joins would be less obvious if the joins were imperfect. I worked on the the right and left walls before I glued them in, which made things much easier. Getting the left wall at right angles to the floor was a challenge to say the least - since I did not have the ability to hold it from the left side, but could only tap it into place from the right. This right angle ruler helped me a lot. I decided not to glue in the skirting board until after the floor was down - leaving more room for error in that department. The old window sill fell out, to I made up a new one (old on the right). Before the right wall was glued in I also decorated the other side. I think the blue compliments the other colours in the house (please excuse my camera, it doesn't show the colours here very well). I won't use a cornice in the blue room (since it is only a bedroom and probably quite plain). I think it looks ok without one. It looks great Emily, I love the paper you chose for the bedroom and hallway. I use hinges to hang my doors, I first glue the hinges to the door, I normally use a scrap piece of flooring with a piece of paper to lift the door so that it won't scrape on the floor. Once I am sure everything fits well, I put glue on the hinge leaf that will be against the door surround, put it in place and support the door with a tin or box and leave it alone till the glue is properly dry, then I drill holes into the door frame through the hinge holes and push the little pins with a drop of glue into the door frame. I didn't have a blog when I build my house and never took any photos of the progress, but it isn't finished, so when I work on it again I will do some posts on it. Thanks for the tip Elga! I hadn't even thought of doing it that way. I will definitely try it out. I think it is going to be difficult no matter how I choose to proceed, though that is what miniatures are all about I think! Oh great, it would be great to see some of your early work. I really like the blue for the bedroom and I agree about the cornice, that would never be there in an attic room. The yellow is quite gentle, so you could choose any colour for the bathroom. That's a really good tip from Elga to glue the hinges in and not just the pins! I hung the doors without glueing the hinges (back in 1992) and not only is it really hard to get the pins in while holding the door, some actually fell off after a while all by themselves! Must have been the earthquakes I caused doing other things to the house:D I ended up with more or less the same method as Elga, with little paint pots on either side of a door and folded paper under and another small piece of folded paper between the top of the door and the door frame. I'm glad you like my colours. Yes, the doors are going to be a challenge. Thank you for the further tips - any tips I can get are gratefully received! Terrific choice. i love that paper. The rooms will be absolutely beautiful. you did an excellent job on some difficult shapes. It was a good idea to divide up the attic space and the colours you've chosen work very well together. Thanks for the encouragement! I am still not quite sure about the bathroom - whether I should go for bold colours or something pastel. Rest assured though, when I choose it will be a well considered decision, whether or not it looks good! Wow!! You have been busy, it looks wonderful.Your choice of colours work really well together.I think your right about not doing the skirting until the floors are down. would probably go for softer colours in the bathroom just to give a good sense of space, but stronger colours are more victorian. Thanks for the suggestions Fi, I was actually thinking a pastel would be good - perhaps even not wallpapering and just painting. Haven't decided yet! Of course many Victorian bathrooms had tiles like the ones in Fi's kitchen and black and white was quite popular colors for Victorian bathrooms. Lovely pictures, thanks Elga! So many options! Yes, tiles is one option, as well as vertical wood dado boards. I want to do tiles, but am not 100% sure I will do them well (despite all the great instructions I have been provided with). You are probably right though - tiles will look good! Thanks! I am going to try and finish this room off this weekend - because we have a long weekend here in Australia. Stay tuned! Thanks for the encouragement! I havn't chosen the bathroom colours yet, it is so tricky to get a harmony with the scheme!